Can you believe it? 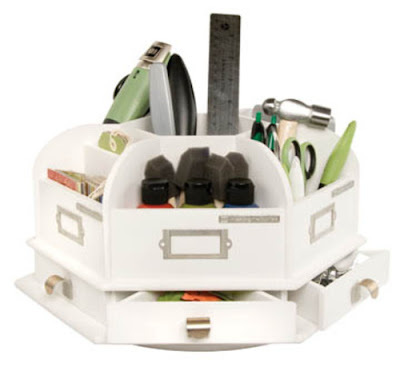 Crafty Storage got a mention in Scrapscene blog, very cool. I mean I only started it August 20th! But I am guessing -because I am genius, not!- storage is big with crafters. In other link news, an interesting article by Abey Garvey on Simple Scrapbooks on "Designing an Inspiring Space". Also I found this post in the Simple Blog about organizing all your stash by color, which not only has photos but also explanations about why and how it works. My thoughts? it will work for some but not for everyone, because some scrap with color and some scrap with texture and visual weight. Also I have add a few new links to craft rooms, on the right. I am loving Nichol Magouirk's studio, and you can see her work here. And since it would be terribly boring an entry without a photo, here you have the new carousel by Making Memories Storage (Summer CHA release). Doesn't it look neat?